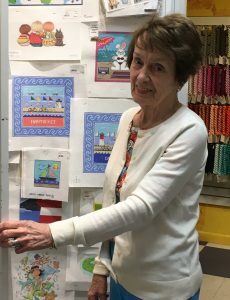 For over 20 years, The Wellesley Needlepoint Collection has offered stitchers the largest selection of hand painted canvases, threads, and needlepoint accessories in the area. 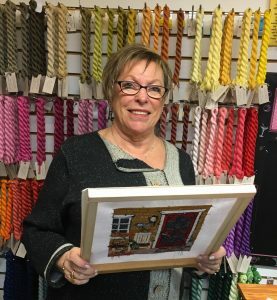 We are a full service shop with a staff of experienced, knowledgeable stitchers who are happy to assist you with thread selection and to suggest stitches, ideas and techniques to bring your needlepoint canvas alive. Once your piece is stitched, we have access to finishers who can transform your piece into a pillow, an ornament, a framed piece, etc. The finishing ideas are endless. We have on-going stitching groups every morning of the week and once a month on Saturdays. 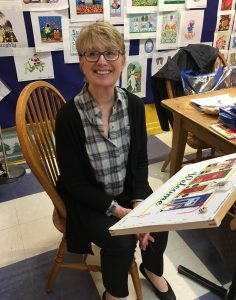 Our staff offers mini workshops throughout the year and we bring in national teachers for exciting, special project workshops several times a year. 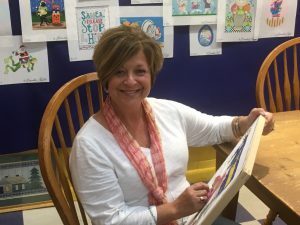 Cindy left a 20 year career in book publishing and decided to indulge her lifelong love of stitching by opening a needlepoint store. 20 years later, she’s still at it and has never looked back! Needlepoint is such an evolving, passionate, colorful and creative industry and Cindy is delighted that The Wellesley Needlepoint Collection has been a part of all the wonderful components of this needleart. Genevieve has been here for almost the entire life of the store and is a friend and consultant to everyone! Her knowledge of threads, stitches, and finishing are invaluable to us all. “General” Genevieve is a fixture here and you can find her here on Wednesday, Thursday (she runs the Thursday morning stitching session) and many a Saturday. 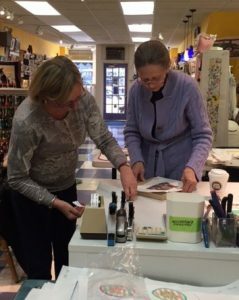 Sandy had been a favorite customer and fellow retailer in Wellesley prior to joining the staff 7 years ago. 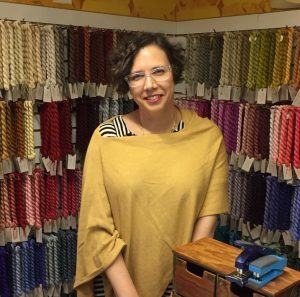 She is a beautiful and prolific stitcher and is more than ready, willing and able to help select a canvas, choose threads and stitches for a project or offer finishing idea. Sandy is here every Monday, Tuesday, Wednesday, Thursday and several Saturdays a month. Ellen helps keep the important administrative part of the business running smoothly. Although Ellen is a gifted stitcher, we are utilizing her organizational talents to coordinate our special projects like our clubs, workshops, and exclusive designs. She is also keeping our thread racks chock full by staying on top of the thread orders. She spends sometime in the “front of the store” on occasion and is eager to have more one-on-one time with customers. Page came aboard to coordinate and advance our external communications. She is completely revising the web site, communicating via Facebook and other social media and working on ads and articles for industry and community publications. Page was a favorite customer and is a splendid stitcher. We’re delighted to have her here on Monday, Tuesday and an occasional Friday, she would love to work with you. We are thrilled to welcome our newest staff member to the team. 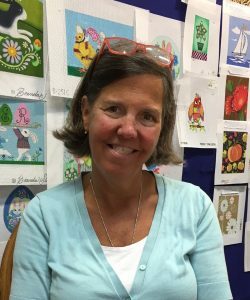 Susan comes from generations of stitchers and her passion for needlepoint started as a young child. After decades in the high tech industry, Susan opted out in search of a more creative path. At the shop, Susan works both with customers and behind the scenes, and she loves it when she shares a shift with her co-worker Amos. 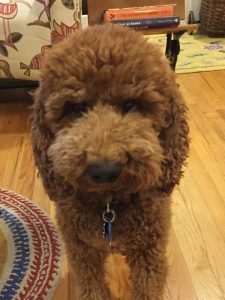 Amos joined The Wellesley Needlepoint Collection team when he was 8 weeks old and has lived up to the adage: “it’s a dog’s life” ever since. Although he is Cindy’s dog, he is walked by Sandy, listens to Genevieve’s daily nuggets of wisdom, gets treats from Ellen and is getting some “behavior modifications” from Page. Although he is a lousy stitcher, he is a loved and welcome addition to the store. Vicki was a store owner and now teaches her classes here at our store and other locations as well. She has a very talented group of followers and is wonderful stitcher with years and years of experience. See our Classes tab for details on joining her classes. 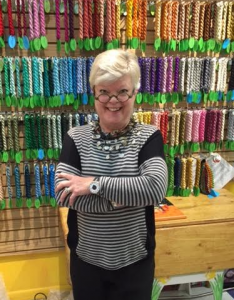 We’re delighted to have Cindi Dickerman on the team here at Wellesley Needlepoint. She is a long-standing customer who is a very creative and innovative stitcher. She does wonders with stitchery, beading and ribbons and is willing and happy to share her talents with us and with customers. Cindi and her husband are avid sailors and enjoy the warm weather months on their boat. She also a wonderful cook and “truffle maker” and we’re hopeful she will bring her goodies into the store from time to time!